Why Choose Bloom? - Bloom! Montessori® School. Contemporary scientific research has shown that the first six years of a child’s life is of paramount importance. More than 60% of your child’s mental development takes place before they are six years old. Your child’s brain is literally wiring itself and determining how information will flow through the brain’s structures and get processed. This early wiring forms the brain’s basic organizing template and is highly resistant to change. Your child’s cognitive abilities and personality will be largely shaped by the environmental influences they are exposed to on a consistent basis at this young age. Bloom! Montessori® understands that the first six years of a child’s life are a profoundly formative time; we give these years the respect and recognition they deserve. The Montessori method nurtures your child’s independence, stimulates her intellect, cultivates her love of learning, and protects her natural inquisitiveness and curiosity. Bloom! 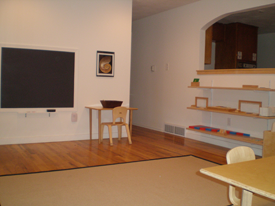 Montessori® provides an optimal environment for your young child. Our home-like environment, and small, close-knit community provide a relaxed learning environment and a convivial, familiar atmosphere. Larger schools and child care centers generally have more employees, frequent staff scheduling changes, and regular staff turnover which is not developmentally appropriate for young children who are forced to continually attach and re-attach to new caretakers. At Bloom, our children remain with the same Montessori guide for three year cycles to promote consistency, bonding, and trust. Additionally, our student teacher ratio never exceeds 1:6, ensuring your child gets the individual attention she needs. To meet the needs of modern families, we provide serveral options for enrollment. Many schools offer a three or four hour program followed by an after school program which requires children to transition to a separate environment with different caretakers. We eliminate these unnecessary and stressful transitions, maintaining the consistency and integrity of the Montessori experience. We recognize that parents are a vital part of our community! We offer regular parent education workshops, and maintain a large lending library of Montessori books and publications. We also realize that strong marriages create flourishing families and offer a monthly Parent's Night Out (beginning in October) during which evening child care (5:30-8:30) is provided to give parents the opportunity to have an evening off. Our lead teacher is a highly experienced Montessori guide who holds an American Montessori Society (AMS) credential for this age group and regularly attends and contributes to Montessori conferences and professional development workshops. In addition to the required college education and Montessori coursework, the AMS certification process requires a year of supervised student teaching at an accredited Montessori school and a year of supervised visitations from an AMS field consultant who observes the guide in the classroom setting. We are conveniently located in walking distance of Southmoor Park, Quail Ridge, Rainbow Ridge, and Prospect neighborhoods. We are less than a mile from Highway 119 and Highway 287. We provide an environment that is both safe and environmentally sound. At Bloom, we serve children nutritious snacks and filtered water. We use whole grain, organic, minimally processed ingredients whenever possible. Our lawns and playgrounds are never treated with pesticides or chemical fertilizers. 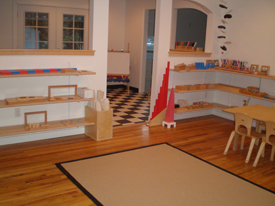 Children use primarily wooden, hand-crafted, sustainably produced Montessori materials that are certified to be lead free and produced by a family company that partnered with Maria Montessori herself and has made Montessori materials since 1920. We only employ healthy, non-smoking, professionals who share our philosophy and a passion for early childhood education. Bloom! Montessori® is a member of the American Montessori Society (AMS), which is the largest Montessori organization in the world. We are also members of the North American Montessori Teachers’ Association (NAMTA) and licensed by the State of Colorado Division of Childcare. From the beginning, the name "Montessori" has been in the public domain in the U.S. As a consequence, any school or program can claim to follow the Montessori method without regulations or restrictions. Having untrained teachers professing to teach Montessori is one of the things that has given a negative impression to the public and the educational world, and it makes it difficult for a parent to be sure of the quality of the school. As a result, when comparing programs, it is important to verify a school's affiliation with the Association Montessori Internationale (AMI) or the American Montessori Society (AMS) to determine whether the school's program actually uses Montessori methods. "The age from birth to six is one of active peace, of obedience and love, when discipline becomes established, when work is perfected and multiplied, just as when the flowers in spring get their colors and prepare a distant harvest of sweet and nourishing fruit."